West Palm Beach is one of Florida’s most alluring cities and a firm favorite of the Property Matters team. With its friendly small-town ambiance, West Palm Beach enjoys a great climate, excellent schools, world-class shopping and unsurpassed dining and entertainment options. 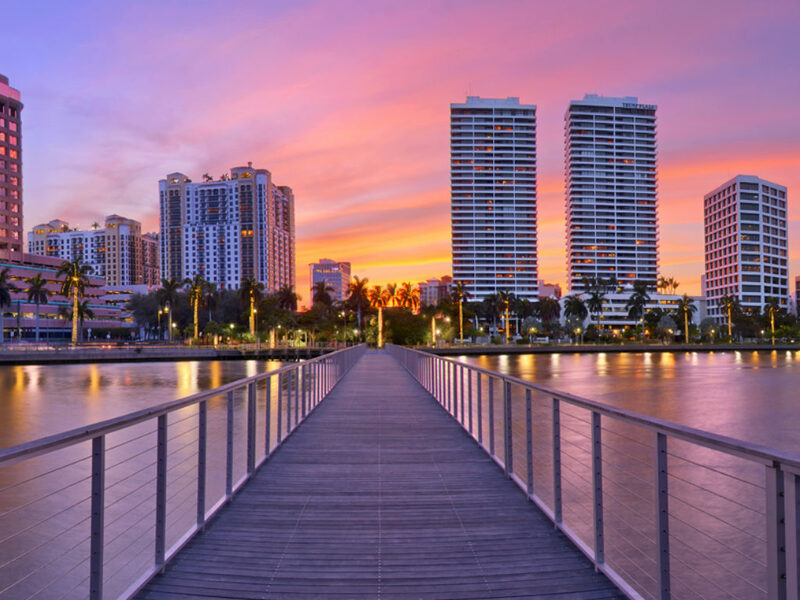 We have picked just a few of the many highlights to whet your appetite and encourage you to add West Palm Beach to your list of potential relocation destinations in our blog ’10 excellent reasons to locate to West Palm Beach’. With its tree-lined streets, beaches that line the coast and stunning ocean views, West Palm Beach combines natural beauty with clever design to create a wow factor for both residents and visitors. We are big fans of the area and especially the miles of easy-access public beaches where we spend the weekends with our families snorkelling, paddle boarding or enjoying the nearby walking trails. Ranked by Forbes Magazine as the #1 city in Florida for business and careers, West Palm Beach has a long history in curating successful businesses. One example is Pioneer Linens located on Clematis Street remains a family-run business and is a leader in luxury linens for homes & yachts since 1912. We are blessed with a multitude of cultural destinations and activities. Some of our favorites include the Norton Museum of Art and the Kravis Center for Performing Arts. The Norton Museum of Art has become one of Florida’s major cultural institutions. The Museum is internationally known for its distinguished permanent collection featuring American Art, Chinese Art, Contemporary Art, European Art and Photography. The Museum is currently undergoing redevelopment by Foster + Partners and we are excited to see the final outcome! The Kravis Center for Performing Arts hosts a feast of delicious entertainment, from ballet, dance, and musicals to plays, book readings and comedies. A diverse range of events to please every member of the family and friends. You might have heard of the Carefree Theatre – a famous landmark in West Palm Beach. The venue has been pulled down and producer and distributor Charles Cohen is redeveloping the site into a new six-theater art house with luxury apartments, restaurants, shops and underground parking. We eagerly await the venue’s opening. For the sculpture fans amongst us, a visit to the Ann Norton Sculpture Gardens is the order of the day. Or perhaps stroll through Northwood Village, the cultural hub of West Palm Beach, where you can experience a regular art walk or simply soak up the charming, quaint atmosphere; what could be better?! If you are looking for schools for the family, then it’s reassuring to know that the county is the 11th largest school district in the USA with an excellent choice of public and private schools. We are lucky to have a diverse range of establishments such as The Greene School designed to prepare students to analyse situations, make decisions, solve problems and communicate effectively in a dynamic world. There are plenty of dining options in West Palm Beach and definitely something for everyone; from fine dining and one-off family run establishments to popular national restaurant chains. You can delight in a range of diverse tastes from around the world from Latin street food to Ethiopian cuisine. Some of our favorites include Grato, Kitchen, Cholo Soy Cocina and opening soon, Lynora’s. Retail therapy in West Palm Beach is a popular pastime, and its shopping outlets and districts provide a staggering array of options. Clematis Street is the historical heart of Downtown West Palm Beach with its colorful boutiques to purpose-built CityPlace with its 600,000 square feet of retail businesses, West Palm Beach is stuffed full of excellent shopping options. Browse the many options available on WestPalmBeach.com. Peanut Island Park – you can camp on the island and enjoy its beaches and amenities while visiting the blast shelter built in secret for President John F. Kennedy. Lake Lytal Park – the 70 acres park and Family Aquatic Center featuring several sports fields and the fun pool with slides and splash playground. Palm Beach Zoo – get up close and personal with a sloth or organize a regular family trip around the zoo to enjoy the wildlife and its 11 daily shows and talks. Mounts Botanical Garden – 14 acres features a wealth of plants that thrive in the Florida climate. Loggerhead Marinelife Center – devoted to the preservation of the marine environment and especially sea turtles. Finally, a visit to the area isn’t completed with a trip to The South Florida Science Center and Aquarium. It houses interactive science exhibits and includes an aquarium and planetarium. The center recently underwent a $5M expansion which included the addition of a 10,000 gallon Aquariums of the Atlantic display as well as an interactive Science on a Sphere exhibit. At various points in time the whole Property Matters team located and their families to the area. The big stand-out for all of us was the extremely warm welcome that we all received from the local community. If you want to put this to the test, come and talk to the Property Matters team where you will get an equally friendly reception plus more local insights and a hot or iced tea! Call Ted Brown +1 561-508-9000 or email to tedbrown@propertymatters.net to arrange a time to meet and discuss your buying and selling objectives, and how the Property Matters team can help you.